Actors Anil Kapoor and Satish Shah may have had a deja vu on the sets of Fanney Khan on Tuesday. 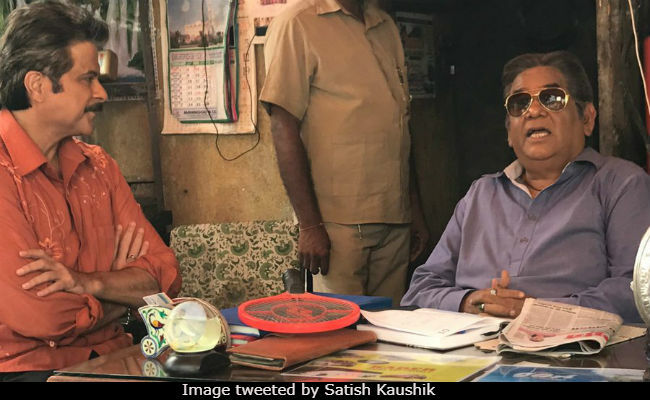 Mr Kapoor's Mr India co-star Satish Shah shared a photograph from the sets of the new movie, with a heart-warming caption. The veteran actors have famously co-starred in 1987's cult classic Mr India - Anil Kapoor played Arun, a violinist who looks after a house full of orphans by day and becomes the titular vigilante by night and Satish Shah played Calendar, the house cook. In the movie, Calendar was an indispensable part of Mr India's many adventures and has continued to remain a much adored Bollywood character. "Shooting with pleasure with Anil Kapoor after 15 years as an actor. Chemistry remains the same.. #Woh 7 Din to #Fanney Khan," wrote Mr Kaushik, who's also shared screen space with Anil Kapoor in movies like Ram Lakhan, Roop Ki Rani Choron Ka Raja and Deewana Mastana - 1983's Who Saat Din was their first movie together. They were last seen together in 2003's Calcutta Mail. Anil Kapoor was quick with his response on Twitter: "It's like not a day has passed! Energy and chemistry truly is the same! So happy to be working with you again!" Directed by Atul Manjrekar (his debut film), Fanney Khan has an impressive cast - it also stars Aishwarya Rai Bachchan and Rajkummar Rao. The 60-year-old actor features as an aspiring singer in the movie, which explores the dynamics of a father-daughter relationship. Fanney Khan is believed to be a remake of Dutch film Everybody's Famous and body-shaming is also one of issues the movie tackles.